William J. Keith, Hospital Corpsman 1/c, born April 7, 1922, North Weymouth, MA. Education: high school, Wentworth Institute, diesel mechanics. 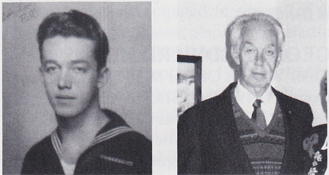 He joined the USN Aug. 21, 1940, and was stationed in Newport, RI, for boot camp; USS West Virginia and USS Chester. Discharged March 15, 1945, as HCl/c. He received the Good Conduct Medal. After discharge, he married Barbara Judkins and started work as a diesel mechanic. They were blessed with three sons, three daughters, and took in two other children. They now have 18 grandchildren and four greatgrandchildren. Retired he spends a lot of time with his grandchildren and going to schools to show films, pictures and talk about Pearl Harbor. He belongs to the Pearl Harbor Survivor Association.